Available in 8 different Ostrich print Cowhide Colors. 13, 14, 15, 16 and 17 inch seats. Quarter Horse Bars. 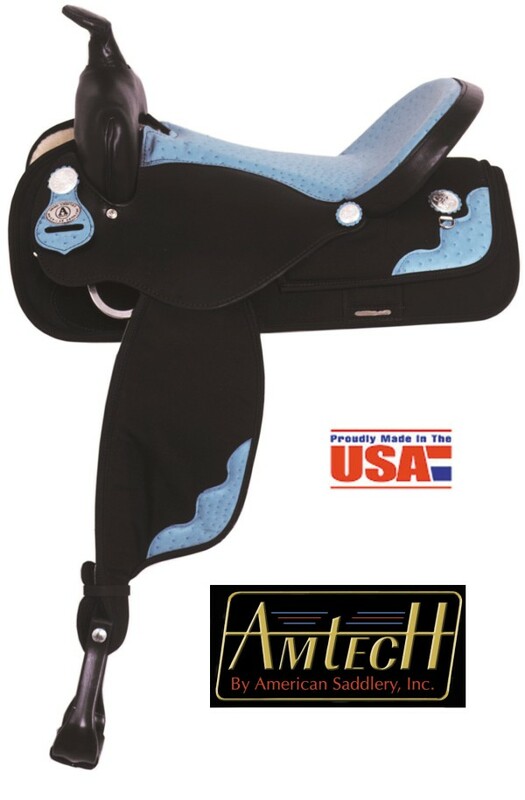 This leather / synthetic saddle gives you a combination of the features of traditional saddle craftsmanship and the breakthrough materials of the future. Traditional because the stainless steel dees and rigging are attached directly to the Amtech pleasure tree. Breakthrough because the skirts and fenders are covered with 1000 Denier Nylon. With leather front, jockey, cantle and padded ostrich print cowhide seat as well as ostrich print overlays with silver conchos. COLORS: Pink, Red, Purple, Lime, Turquoise, Sky Blue, Black, Brown, Tan. RIGGING: Stainless steel dees in 7/8 position.